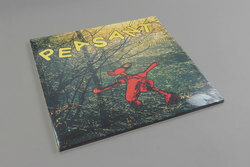 Richard Dawson - Peasant. Vinyl LP, CD. Bleep. Leftfield artist Richard Dawson has a reputation for drawing on unlikely subject matters in his songwriting. Here on his sixth solo album, he sets his sights on the English Middle Ages, a subject used to death with unfaltering success in film and literature but one that rarely if ever hits the right note in music. Peasant, then, comes as some surprise. The stories weaved are so personal that any olde worlde caricature or stereotype is instantly dispelled. Every tale is painfully relatable. "How is it so," he asks in 'Prostitute', "that a child can be bought for a year’s worth of grain in this day and age? It’s hard to explain, but it happens again and again." Musically, it is equally as rich in reference, originality and melancholic humour. It's not the easiest listen initially but, as Captain Beefheart and Daniel Johnston have proven, it's often that precise quality that makes an album stick. Outstanding.